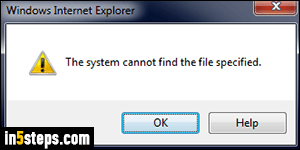 At some point, Internet Explorer 11/10/9 will give you a The system cannot find the file specified error message. That usually happens when you're trying to save an image, but that's just one example of a larger symptom: IE has been running for a long time, with too many windows and/or browser tabs opened. I'll show you how to fix the problem, and save what you need to save. Skip to the next step if you're not interested in saving pictures from the tabs still opened. While you can't save any picture when Internet Explorer is in that state, you will still be able to copy them. 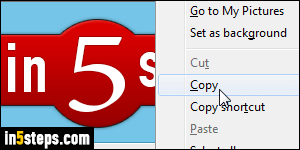 Right-click on the picture you want to keep, but choose "Copy". Now launch MS Paint (just type "paint" in the start menu and hit Enter). Paste the image in Paint and save it where you want. Now close all Internet Explorer windows, bookmarking any tab you'll want to read later. 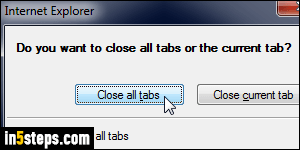 To go faster, if you're not interested in keeping these tabs: instead of closing individual tabs, click on IE windows' own close button, and confirm "Close all tabs" when you get the "Do you want to close all tabs or the current tab" popup. Keep going until no Internet Explorer window is left open. This problem often comes from "memory leaks" (RAM), when a window was closed, but didn't fully quit. So we'll manually kill any IE process left hanging in the background. Right-click on the start button and choose "Start Task Manager". 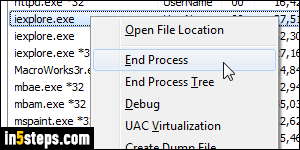 Select the "Processes" tab, and sort it alphabetically if needed (click on the Image Name header if it isn't already showing an arrow). 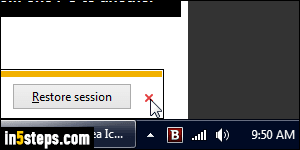 Now go through each instance of "iexplore.exe" you find, right-click on it, and choose "End Process" from the menu - that kills the Internet Explorer processes.